Turbo Turf HydroSeeding Systems are manufactured by Turbo Technologies in Beaver Falls, PA. Turbo Technologies began manufacturing jet agitated hydroseeders in 1990 and expanded into mechanical or paddle agitated hydroseeders in 2004. Turbo Turf affordable, easy to run, and low maintenance systems quickly became the largest selling jet agitated units in the world. Turbo Turf’s paddle agitated units have also been very popular since the poly tanks we use can eliminate one of he major problems competition has which is rust in their metal tanks. The poly tanks used in the mechanical or paddle units also speed clean up and last nearly forever. 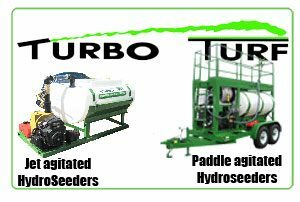 Turbo Turf’s mechanically agitated hydro seeding machines are available with either low cost belt drive or hydraulic drive which allows both the paddles and pumps to be run in either direction. Turbo Technologies is located in Beaver Falls, PA which is in Western Pa, about 25 miles north west of Pittsburgh and close to the Pennsylvania Turnpike, as well as Interstate 80 and 79. We welcome visitors and if you have an opportunity to stop by we would be happy to show you our facility and our products. Our hours are 8-4 weekdays but we can arrange to be here other times. Turbo Technologies manufacturers jet agitated hydroseeding systems in sizes from 50 to 1600 gallons and paddle agitated systems in 400, 500, 750 and 1,000 gallon sizes. We also manufacture ice control sprayers for de-icing and anti-icing roads and parking lots in the winter, Brine makers for making liquid brine for de-icing, straw blowers, turf sprayers and watering units.